In September, the UW-Madison School of Music will welcome violinist Soh-Hyun Park-Altino to its roster of full-time faculty. Prof. Altino hails most recently from Memphis, where she served on the faculty for 14 years. Read Prof. Altino’s biography here. Save the Date: Prof. Altino will make her concert debut in Madison with pianist Martha Fischer on November 13, 8 PM in Mills Hall. Tickets $12, and available at the Memorial Union Box Office or day of show at Mills Hall. Student admission is free. Soh-Hyun Park Altino. Photograph by Caroline Bittencourt. What motivated you to seek the position here at UW? I first heard about the UW-Madison School of Music and its fantastic string faculty when I was attending the Cleveland Institute of Music as a graduate student. Later while I taught at the University of Memphis, I often encouraged my students to consider UW-Madison for further schooling because of the reputation of the faculty. So I was excited to find out about the violin position last fall, and I am honored to be joining such an excellent community of musicians and scholars here at UW-Madison. What gives you the greatest pleasure as a teacher of young students? My greatest joy as a teacher is the up-close witness of the journey that each student takes throughout the course of his or her study. As we discuss and explore countless ways to communicate a story through the sound of a violin, sooner or later students face challenges that would push them beyond the familiar and the manageable. I love seeing my students grow to the point of taking steps of courage and giving generously from their hearts in spite of the difficulties presented in their pieces. The confidence gained by these experiences remains with them for the long haul. Do you have special qualities, strengths, skills that you’ve honed over the years? I believe, in order to be able to truly help my students grow as individual violinists and artists, I need to first get to know and understand how each one hears music. Different people will hear different things in the same performance. My role is to help them become aware of other things that are going on in the music and to assist them in acquiring necessary tools to express these ideas. My students often tell me that I am very patient during lessons; that always sounds funny to me because I think of myself as a impatient person in general. Working out long-standing and unhelpful physical habits in my students’ playing energizes me as I hear and see the freedom in their music just around the corner. Do you enjoy performing any particular musical styles/time periods? I enjoy learning and performing all good music, from the Baroque to the contemporary. While I love chamber music of all kinds, my favorite genre is works for violin and piano. It feels like an intimate conversation between two close friends that are inherently very different from each other. Where have some of your students gone after study with you? It’s extremely important for me to guide each of my students toward a career path that would make use of their individual gifts and strengths. Many of my students have gone on to study at major conservatories and universities and after schooling, they secured professional positions in various places. Some are teaching at colleges, in school string programs, and in Suzuki schools while some are performing in professional orchestras. And some others have found their calling in musicology and arts administration. I truly believe that, for us musicians, our satisfaction in what we do depends largely on the sense of continual growth. You will bring your husband, a cellist. Have you collaborated? My husband, Leo, and I met playing and teaching together at a festival, and we have performed concertos, duos, piano trios and beyond ever since. We love to play with and for each other and value each other’s honest commentaries; over the years we have become each other’s teacher. We are just beginning to get to know the area and are very excited about our new adventure in the musically dynamic city of Madison. Had you been to Madison before? My first time in Madison was for the interview and audition for this position in April, and I didn’t know a lot about the city, but since accepting the position, everyone around me has given me nothing but enthusiastic reports about Madison. My family and I moved to Madison in late July, and I have to agree with my friends’ opinions about the city. Do you have an inkling of your concert program? I am so looking forward to working with Martha Fischer and presenting a recital with her in November. The program includes the C major solo sonata by Bach, the second sonata by Brahms, and Charles Ives’s sonata no. 2. The 2015 fall semester at the School of Music will be marked by the addition of a new tenure-track professor of violin, Soh-Hyun Park Altino, and adjunct professor of clarinet, Wesley Warnhoff. 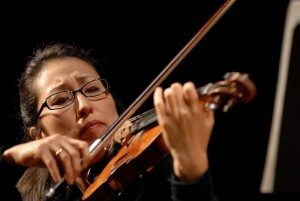 Park Altino replaces Felicia Moye, a tenured violin professor who decamped to McGill University in the summer of 2014 and was replaced for 2014-2015 by Leslie Shank. Warnhoff replaces Linda Bartley, a tenured professor of clarinet who has retired. Below are their official biographies. Violinist Soh-Hyun Park Altino is highly regarded as a gifted teacher and a versatile performer of solo and chamber music. Her concert engagements have taken her to Brazil, Colombia, Germany, Korea, Venezuela, and throughout the United States. Praised for her “poise and precision,” she has appeared as soloist with the Memphis Symphony, Jackson Symphony, Peabody Concert Orchestra, Masterworks Festival Orchestra, Sinfonica de Campinas in Campos do Jordão, Festival Virtuosi Orquestra in Recife, and Suwon Philharmonic in Seoul among others. She has collaborated with renowned artists such as Monique Duphil, Oleh Krysa, Suren Bagratuni, Daniel Shapiro, and Jasper de Waal in festivals such as Duxbury Music Festival, Masterworks Festival, the Academy y Festival Nuevo Mundo in Venezuela, and in the Memphis Chamber Music Society concert series. Prior to her joining the University of Wisconsin-Madison School of Music in 2015, Soh-Hyun served on the faculty at the University of Memphis for fourteen years. During her tenure at Memphis, she frequently performed with pianist Victor Asunción and cellist Leonardo Altino in the Dúnamis Trio, and as a member of the resident ensemble, Ceruti Quartet, she presented recitals and educational programs throughout the U.S. as well as at the National Assembly in Seoul, Korea and Teatro Santa Isabel in Recife, Brazil. The quartet’s recording of the Debussy Quartet released in 2013 was hailed by Gramophone for its “physically emotional power.” As an enthusiastic supporter of new music, she has enjoyed working closely with composers such as Steven Mackey, Margaret Brouwer, James Mobberley, and Kamran Ince, and in 2014 she premiered a commissioned work, En Voyage for violin and cello, by Paul Desenne. As a dedicated teacher, Soh-Hyun directed the String Intensive Study Program at Masterworks Festival for eleven summers, taught through projects such as Fabrica de Musica and eMasterclass in Brazil and Festival y Escuela Internacional de Musica in Colombia, and presented violin master classes at universities nationally and internationally. Her experiences and insights gained from overuse injuries as a student have served as one of the major factors that inspire her passion and inquisitiveness for teaching, and she has become an advocate of continuing education for performers and teachers. To this end, she has regularly presented professional development sessions and held forums and clinics for violin teachers and their younger students. While her former students are national competition prizewinners and members of professional orchestras, a great many of them are devoted teachers at colleges and string programs across the country. A native of Korea, Soh-Hyun grew up in a musical family and studied with Young-Mi Cho. At age sixteen, she came to the U.S. and studied with Violaine Melançon at the Peabody Institute where she was also given intensive training in chamber music and music theory, and she was a participant at Yellow Barn, Kneisel Hall, Tanglewood, Aspen, and Sarasota Music Festival. Her major chamber music coaches include Anne Epperson and the members of the Peabody Trio and the Juilliard, Concord, Cavani, and Cleveland Quartets. Soh-Hyun received her bachelor’s, master’s and the doctor of musical arts degrees in violin performance from the Cleveland Institute of Music, where she was a student and teaching assistant to Donald Weilerstein. 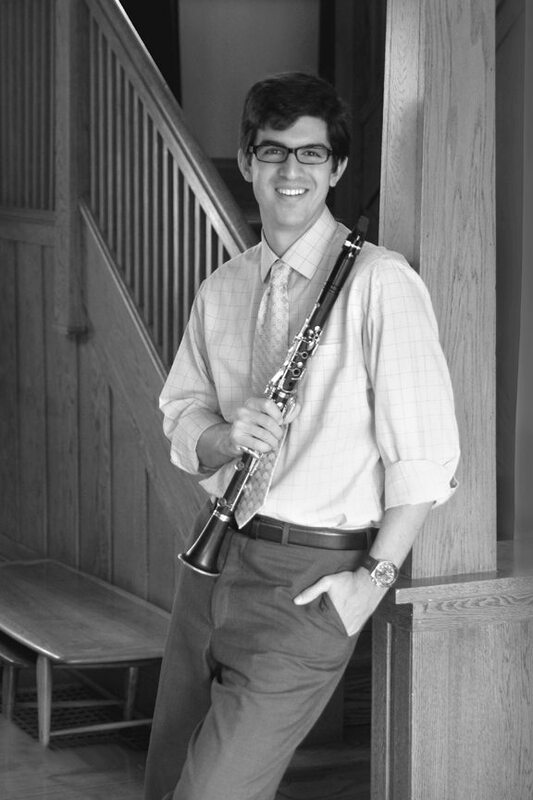 American clarinetist Wesley Warnhoff’s thoughtful and intense performance style has gained him international acclaim as a soloist, orchestral, and chamber musician. Dr. Warnhoff’s research into contemporary techniques has helped him to develop a unique pedagogical approach that provides a new perspective on creating the ideal embouchure and sound concept, and it is this dedication to the art of teaching that makes Dr. Warnhoff a sought after clinician throughout the United States. As a champion of new music he has given many premiere performances including the world-premiere of Murray Gross’ Rhapsody for Clarinet, I Surrender. Along with performing new music, Dr. Warnhoff has also added to the performing repertoire, most notably with his transcription for clarinet, voice, and piano of “La Vita e Inferno” from Verdi’s La Forza del Destino. Dr. Warnhoff is currently on the music faculty at the University of Wisconsin-Madison where he leads the clarinet studio and performs with the renowned Wingra Woodwind Quintet. He is a founding member of the VCP International Trio, a violin, clarinet, piano trio that advocates new music performance, and he is also the principal clarinet of the Battle Creek Symphony Orchestra in Michigan, a post he has held for 5 years. Dr. Warnhoff holds degrees from Michigan State University and Missouri State University. His primary teachers are Dr. Elsa Ludewig-Verdehr, Dr. Allison Storochuk, and Dr. Jack Scheurer.